Crown to heel, your baby now measures around 38cm and more than 900g. That length may sound improbable, depending on the size of your bump, but remember that the baby is tightly curled most of the time. When he or she stretches out you know about it! By now, the baby is behaving more and more like a newborn, opening and closing their eyes, and sleeping and waking at fairly regular intervals. The downy hair covering the baby's skin, called lanugo, will begin to fall out at 27 weeks, but it is still possible that some will remain at birth so don't be alarmed if your little one seems a bit furry when you first meet one another. The list of pregnancy related problems probably seems endless by now, and here is another one to add to the list: your eyesight. If your eyesight has deteriorated recently it is likely that your vision has actually changed. If you are a contact lens wearer then you may also find that they are feeling uncomfortable. 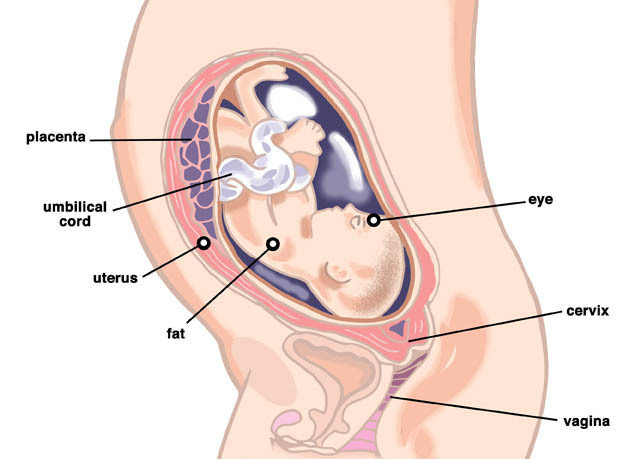 This is likely to be due to dry eyes syndrome, also common during pregnancy. Dry eye syndrome is brought about due to hormones which interfere with your tear production. It might be wise to visit your optician and see whether a new prescription helps you, but now is not the time to go booking laser surgery as your eyesight will change again after pregnancy (probably back to how they were pre-conception), meaning that your surgery would most likely have to be repeated. It is advisable to wait at least six months after the baby is born to give your eyes time to settle down before proceeding with such decisions. Labour fears are perfectly normal, but now is the time to get to grips with your options and to write your birthing plan. Obviously, pain is the most common worry when it comes to child birth, and there is no escaping the fact that it is usually a painful experience, but the pain can be managed. It is important that you educate yourself as to how you can do this. Do your research into pain relief; don't overlook complementary or alternative approaches. Make sure that you are aware of how to practice breathing, stretching and toning exercises that can help during labour. You have probably heard many people talk about a birthing plan. Some women arrive in hospital with their instructions listed on sheets of paper and a clear and definite intention to deliver their baby in one particular way. This is not the purpose of a birthing plan. Labour can be unpredictable, so assuming that you will deliver your baby in the birthing pool without any additional pain relief could be setting yourself up for disappointment. Having a birthing plan need not mean having instructions in writing, but the process of putting it together (through research and discussion with your partner and other people) is important so that you are clear in your mind how you would like to manage your labour. It is also very important that your birthing partner is clear on your intentions so that they can communicate on your behalf if necessary. Accept that your dream birth may well not be possible and try to have a back-up plan (or several, just in case). If you have applied to join an antenatal class then you will meet other parents-to-be with similar worries and questions which will help to put your mind at ease. Your class teacher will also help you to make decisions about your birth plan.